"70cl / 43.0% - The second edition of Balblair 2000, a classic Highland dram which was relaunched in 2007. A very fruity, creamy whisky aged in American bourbon oak barrels." 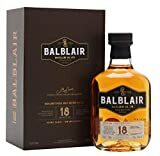 Balblair 26 Year Old 1991 vintage Highland single malt Scotch whisky. Double matured in first fill Spanish Sherry Oak Butts. 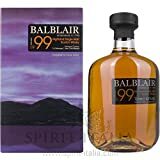 Balblair Vintage 1999 + GB 46,00% 1 l.
Balblair Vintage 1999 + GB 46,00 % 1 l.
BALBLAIR 2003 SINGLE MALT SCOTCH WHISKY 70CL BOTTLEA distillery-bottled Balblair from the 2003 vintage. 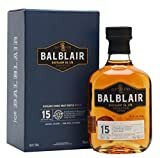 Long known to blenders as a category 'A' malt, Balblair was relaunched in 2007 and releases whiskies by vintage rather than by age.